Every time Apple updates Safari, it seems like there’s a war between the sighs of relief—”They finally changed that feature!”—and the cries of outrage—”How could they change that feature! ?” In the case of Safari 5.1, it’s the behavior of opening links in new tabs that seems to have brought these two factions into conflict once again. Put it on the tab—but where? Apple changed the default new tab location in Safari 5.1. For those who haven’t been following along at home, the change is this: In Safari 5.0 and prior, when you open a new tab from a link it shows up all the way at the end of your tab bar. 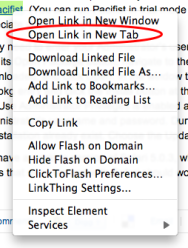 But in Safari 5.1, opening a link in a new tab causes it materialize directly to the right of your current tab. Many users have welcomed the change, which mimics similar behaviors in Chrome and Firefox, but an equal number have taken to the streets—well, the forums—lamenting the removal of their beloved open-at-the-end functionality. In typical Apple fashion, the company has not provided an option to toggle between the two behaviors. Well, we at Macworld are not here to take sides (begone, foul open-to-the-immediate-right partisans! ), but if you’d like to revert to the older Safari behavior, we offer up this free little Safari extension, OpenAtEnd. OpenAtEnd is bare bones; it does exactly what its name suggests—no more, no less. If you’re looking for more functionality, check out other Safari extensions like LinkThing or the development build of Glims. (Note that in my testing, the current version of LinkThing only changes tab-opening behavior for command-clicking a link, not for selecting Open Link in New Tab from a link’s contextual menu.) And, if you’re feeling like these extensions just don’t go far enough, my colleague Chris Breen has instructions for how to revert from Safari 5.1 to Safari 5.0.3. I’ve also been on the lookout for a Terminal hack to restore the old behavior, but none has come to my attention as of yet. If you happen to have stumbled across that, or have any other suggestions, feel free to chime in below.